If you are a Micromax user, you may have noticed a few apps pre-installed which are nothing but bloatwares, but no the situation gets worse. If you have used Micromax smartphones, or bought your first one like I did after I was convinced enough that the Indian brand is launching pretty good handsets, you might have come across some apps pre-installed on your device, like miUnlock, M!Doodle, M!Security and some stupid apps which can do nothing for you. I bought the Micromax canvas Nitro and immediately uninstalled them after rooting the phone, but that can’t be done if your device is not rooted. Now, a recent report from XDA Developers indicate that Micromax is actually installing apps remotely on their smartphones and that doesn’t require an permission from the user. You will have no idea where these apps came from (original or malicious), nor you will know the apps permissions. Micromax handsets have around 5 GB internal space so the space is luxury, and these apps will consume some storage. The apps are installed remotely, so you will never know when yyourmobile data is being used and the data plan is being consumed. 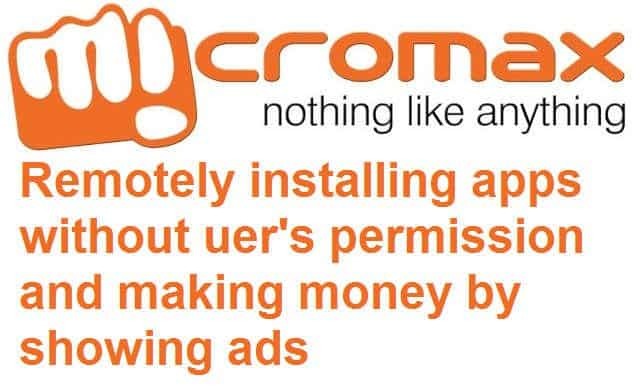 XDA Developers explained how this is done and how Micromax is doing all these, surprisingly the XDA Developers found the reason behind this: Money. Below is the input from XDA, which explains everything. Inside the app I found a few references to the company’s website, including one that has an extensive feature list. Shall we have a look at the most interesting part? Hope, you have heard about XDA and know about their reputation, still I would like to add another evidence. I found a new app named as M!live, which never existed in my phone, but it got installed remotely and just see the video to know what it is. Seriously, that app is one of the worst apps I have ever seen in my whole journey in the Android smartphones experience, full of ads, pop ups and all the craps they could put in the app. In the video I have also included how to remove it, though this process is temporary and doesn’t guarantee that the app won’t be installed again.